Elegance Schools Inc. has been registered and approved as a private vocational career college under the private career college act since 1976. Our college continually strives to elevate and exceed industry standards incorporating the latest methods, technology and products. Classes are teacher led based on academic excellence and practical hands on experience. Students will gain confidence with many hours dedicated to practical application and scheduled client clinic days in our modern school facilities. 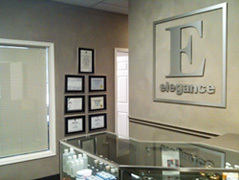 Elegance is also proud to have provided our students with a superior job placement record over the last 40 years.